eGenix is pleased to announce the immediate availability of eGenix mxODBC Connect 2.1.4 - Remote Python Database Interface for Python 2.5 - 2.7. 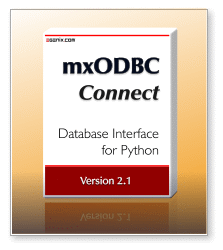 The mxODBC Connect™ Database Interface for Python allows users to easily connect Python applications to all major databases on the market today in a highly portable, convenient and secure way. Building on our mxODBC database interface for Python, mxODBC Connect is designed as client-server application, so you no longer need to find production quality database drivers for all platforms you target with your Python application. Instead, you use an easy to install royalty-free Python client library which connects directly to the mxODBC Connect database server over the network. For the full set of changes, including those of the 2.1 series of mxODBC Connect, please check the mxODBC Connect change log. Support for user customizable row objects by adding cursor/connection .rowfactory and .row constructor attributes. When set, these are used to wrap the normal row tuples returned by the .fetch*() methods into dynamically created row objects. New RowFactory classes to support cursor.rowfactory and cursor.row. These allow dynamically creating row classes that provide sequence as well as mapping and attribute access to row fields - similar to what namedtuples implements, but more efficient and specific to result sets. Compatible with the latest gevent and greenlet packages. mxODBC Connect Client will happily work together with the asynchronous libraries gevent. All it takes is a single configuration entry in the client side config file. For the full set of features, please see the mxODBC Connect product page. You are encouraged to upgrade to this latest mxODBC Connect release. When upgrading, please always upgrade both the server and the client installations to the same version - even for patch level releases. We will give out 20% discount coupons for upgrade purchases going from mxODBC Connect Server 1.x to 2.1 and 50% coupons for upgrades from mxODBC Connect Server 2.x to 2.1. Please contact the eGenix.com Sales Team with your existing license serials for details. Users of our stand-alone mxODBC product will have to purchase new licenses from our online shop in order to use mxODBC Connect. You can request free 30-day evaluation licenses via our web-site or writing to sales@egenix.com, stating your name (or the name of the company) and the number of eval licenses that you need. Please visit the eGenix mxODBC Connect product page for downloads, instructions on installation and documentation of the client and the server package. Fully functional evaluation licenses for the mxODBC Connect Server are available free of charge. The mxODBC Connect Client is always free of charge. For more information on eGenix mxODBC Connect, licensing and download instructions, please write to sales@egenix.com.